Norton Safe Web is a service developed by Symantec Corporation that is designed to help users identify malicious websites. Safe Web delivers information about websites based on automated analysis and user feedback. The software debuted as a public beta in 2008 and is now included in current versions of Norton Internet Security and Norton 360. A limited, standalone version of Safe Web, known as Safe Web Lite, is available as a freeware. Safe Web operates as a web browser plugin, and requires Internet Explorer 6 or Firefox 3 or later. The 2012 release of Safe Web Lite added Google Chrome support. And now, it has opened its doors to the Microsoft Store as well, allowing for people on windows 10 to download the plugin for free. Before getting into the news itself, the function of this extension should be briefed. The extension not only covers websites all over for malicious content and crawlers, but it also uses user feedback from its database in order to provide a safer web environment. When a drive-by download through a URL is done, the suspicious site is sent to the Norton Safe Web for analysis. Once found “iffy”, the link is labelled as malicious and warns users from using it to download content. 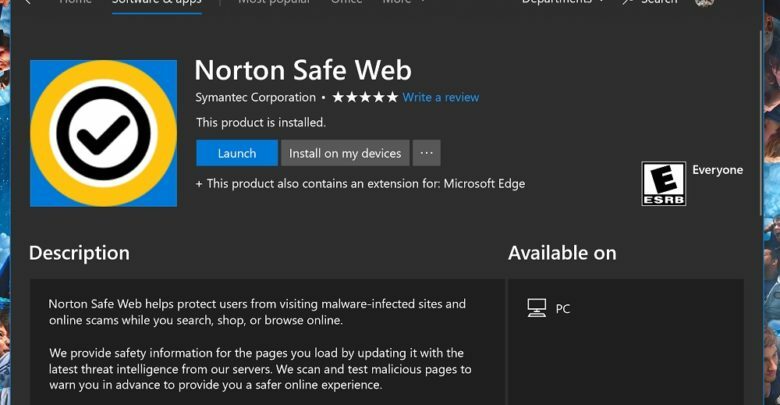 This extension, after being available on many platforms since its 2008 public beta release, finally becomes available on the Microsoft Store as it is signed by Norton itself. The extension is available to download here.